For a number of reasons, including the recent election of Donald Trump, women's rights issues are back to the centre of public debate. The tycoon's statements and attitudes towards women have been harshly criticised by his opponents, generating large demonstrations in many cities. One may be tempted to parallel the US disputes with the latest political developments in Moldova. Trump vs. Hillary as Igor Dodon vs. Maia Sandu. Further away from the international spotlight, the presidential elections of last November have shown some similarities to those overseas. Both in Washington and Chişinau, the defeated candidates had a chance to become the first female presidents of their country, while their opponents expressed rejection and "closure" to societal changes (the appeal to tradition, a certain contempt for sexual minorities, etc...). Dodon and Trump appeared more in tune with Russian President Vladimir Putin (an accord that, especially in the first case, is all to be seen in practice). If the sexist statements of the US president against his rival rebounded on media around the world, Sandu's being a woman was called into question during the Moldovan campaign. "Maia Sandu has no children. How can a woman who has not been able to be a mother become a good guide for the country? ", said a female representative of the Moldovan Democratic Party . Beyond the fascination of parallel chronicles, this analogy can perhaps enlighten some threads of women's issues sometimes misunderstood or underestimated when it comes to Europe. The comparison – and, in many cases, the clash – with the West has indeed characterised the history of women in the Soviet Union, as a kind of "paradoxical axis" catalysing different approaches in the battles for women's rights. As soon as in 1959, in what is remembered as "the kitchen debate" during the Universal American Exhibition in Moscow, Richard Nixon and Nikita Khrushchev argued about which of the two economic systems they led "would make life easier for women ". A few years later, in the United States and throughout the Western world, the youth protest and a new awareness of "gender" would inspire new demands for greater social and financial recognition of women and women's work. The many achievements of that period stemmed from those struggles as well as from the will of governments not to give ground to the Eastern bloc countries, which – at least apparently – reached important results in the inclusion of women. In fact, though almost never making it to the top, many Soviet women gradually assumed leadership roles in factories or political institutions, in a manner fairly consistent with an ideology that sought to overcome both class and gender distinctions. With good approximation – obviously subsuming differences and notable exceptions, if changes in the West started from the bottom, in the East they were primarily dropped from the top. This had an important consequence: trying to address gender discrimination through state planning gradually removed the issue from popular consciousness, resulting in a widespread distrust of movements that would take it up in the future. "We are unprepared, confused, still devoid of an organisation, a movement. Maybe we still fear to call ourselves feminists", wrote Croatian journalist Slavenka Drakulić observing the daily life of women of Eastern Europe shortly after the fall of the wall (How we survived communism and even laughed). 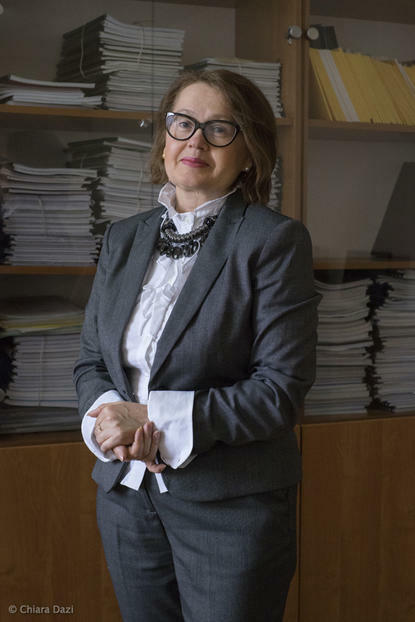 If there is someone in Moldova who has put women's rights at the centre of her personal and professional commitment, this is Valentina Bodrug. Born in 1961, a professor of history and pedagogy at the State University of Chisinau, she moved to Moscow in the late '80s for a PhD. It was upon her return from the Russian capital to the newborn Moldovan Republic that she realised the need for a change of perspective. "During the Soviet period gender discrimination was latent, I was not aware of it myself", says Valentina. "But transition exploded the myth of equality – the erosion of the welfare state exacerbated existing problems and divisions, with women, especially those with many children, suffering the direst consequences of these upheavals. Those were difficult times. As a university professor, I watched my young students struggle and understood their suffering". Hence came a vigorous activity on several fronts. Together with some colleagues and acquaintances, Valentina founded the association Gender Centru (officially registered as an NGO with the Ministry of Justice only in 2000), aimed at studying women's issues and offering direct support to women suffering the transition's socio-economic instability. Even today, the association publishes a number of studies on gender discrimination in the country, carries out information and prevention activities on domestic violence, and is part of Karat, an international network that combines several Eastern European groups involved in the struggle for women's rights. In parallel, Valentina has carried out an advocacy action on Moldovan institutions to develop appropriate legislation on the subject. So she became co-author of the Laws on Gender Equality (2006) and on Domestic Violence (2007), approved not before overcoming a certain distrust. "Many of my interlocutors were against a measure of this type. Some thought it was a matter of little consequence, or feared it would offer a 'bad image' of the country abroad. Others even asked me if the real reason for my commitment was a history of violence in my family. On the contrary, it is precisely because I know the benefits of equality and respect that I think they should be rights for all". But it is perhaps in the field of education that Valentina was able to produce one of the most unexpected turns. She created the first university course focused on gender issues, precisely because of the need for a change of perspective perceived on her return from Moscow. "Obviously, laws are useless without widespread awareness to support them. What I try to do with my course, besides providing historical information on the feminist movement and the struggle for women's rights, is raising awareness in my students. As I said, gender discriminations have been latent for a long time in Moldova, and were not recognised as such. I think, then, that a good starting point is precisely to provide the tools to uncover this 'hidden' component of social relations. Then I think it is right for each person to decline, in their daily lives, their being attentive to gender dynamics". The course has been met with a lot of interest by students, becoming a compulsory examination for education curricula. However, the conditions are missing for this experience to expand and replicate: what is missing is a new teaching class with expertise on gender issues to secure continuity to this experience at the university level. Victoria Apostol and the first "feminists"
What impact gender perspectives can have on Moldova's population remains one of the central questions for activists. Even during the transition, associations for women's rights were born and legislative steps forward were made. But the first explicitly "feminist" group was founded only two years ago. 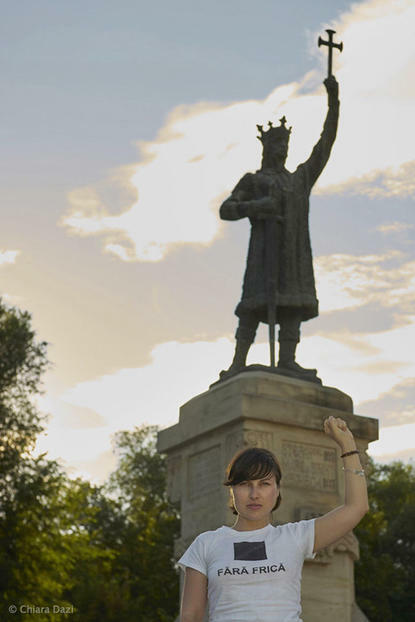 Victoria Apostol, 28, and other young Moldovan women gather on a totally voluntary basis, with an approach that is as grounded and spontaneous as possible. Their initiatives and struggles often intersect with those of the LGBT community, supported by Gender-Doc, and materialised in the organisation of two editions of the march for women's rights of March 8th and the promotion of debates and conferences, most often hosted in the Teatru Spalatorie space. "After independence, almost all efforts focused on the creation of laws and pressure towards institutions", says Victoria. "In Moldova we have advanced laws on the rights of women, but no movement rooted in society. This is why most people are wary of the word 'feminism' – sometimes we are accused of just importing 'Western values' in the East-European context. In fact, we are all local women trying to act here and now”. The marches organised by Victoria's group have so far found modest participation, in large part by internationals – which is not automatically bad, but perhaps shows a cleavage between activists and the rest of the population. Many of the points of the Western feminist discourse are inevitably perceived in different ways in Moldova, and in the East in general. Above all, family has been the subject of clashes and misunderstandings among women's rights activists since the 90s. If, in the Western context, the family unit was identified as the environment where gender discrimination is originated or reproduced, in the post-Soviet and post-socialist countries it was (and still is, at least ideally) a haven from the invasiveness of the state in everyday, when not the only site of personal fulfilment. "You meet a lot of resistance when you try to question what concerns the private sphere", argues Victoria, well aware of the slippery slope she and her group are moving on. Through the site Platzforma, she recently published a fairly strong critique of women's rights policy so far in Moldova, citing – among other things – a controversial 2004 text by scholar Kristen Godhsee, which critiqued the so-called "feminism-by-design " of so many associations supported by foreign funding, a feminism that is actually liberated from the concrete needs of the subjects it intends to contact as it essentially implements action programmes decided elsewhere. "We try to distinguish ourselves from existing NGOs in the direction in which we channel efforts. I believe it is vital to know how to identify the causes that create gender issues. On the contrary, it seems to me that so many organisations focus exclusively on the consequences, often making themselves unable to go to the roots of discrimination. I cannot say that our group managed to eradicate these causes, but at least we have raised the issue". Moldova is at the centre of great change, almost in the form of sudden reversals, but still affecting the depths of society. The disintegration of the family fabric due to emigration; the difficult position in international trade with the consequent internal restructuring of the labour market; the "crisis", close to the agony, of a rural world that is still numerically predominant. It is in the uncertainty of these trajectories that changes in morals and customs play out. Feminism and gender perspectives seem tasked with intersecting with the open questions of the Moldavian present, so that the forms – rightly hybrid, maybe even "borrowed" from the outside – of a possible critique and change of the status quo can take contents vivid and felt by the most. "Gender equality goes hand in hand with the development of democracy", says Valentina. Two open fronts in the coming years.